Take a Network Break! VMware acquires SD-WAN startup VeloCloud, FatPipe asserts its SD-WAN patents, and Cisco may be putting a video unit up for sale. Cisco is also making changes to its reseller program, Juniper launches a programmable photonic layer, and Ciena touts its 400gig Ai chip. 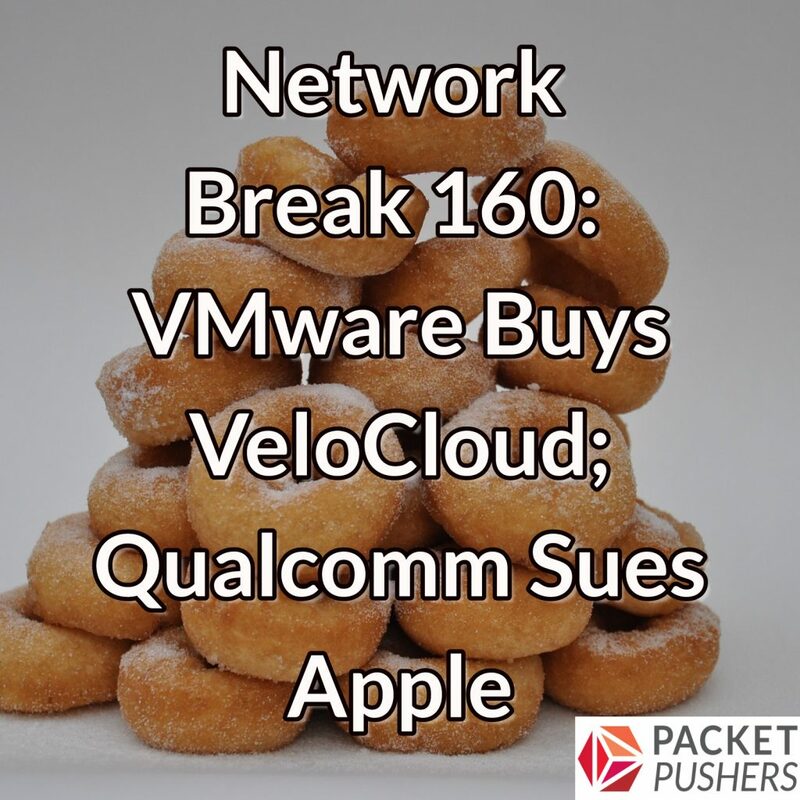 Qualcomm sues Apple after Apple threatens to drop its chips, IBM launches a private cloud platform, Arista has a banner quarter, and Broadcom gets a Delaware address. Get links to all the stories we cover just after our sponsor details. ThousandEyes delivers visibility into every network your organization relies on—from your data center to the cloud. You can quickly and precisely pinpoint the root cause of network issues— wherever they occur. Sign up for an account at ThousandEyes.com/packetpushers to monitor 3 locations for free, and choose a ThousandEyes t-shirt. With InterOptic you can purchase high-performing optics designed by engineers who truly understand what you need–at a fraction of the cost. Get more information at interoptic.com/packet-pushers and tune in to the Packet Pushers Weekly Show 360 to hear InterOptic CEO Tim Dixon as he opines about transceivers, the Shannon limit, and the future of optics in the data center. Where do Velocloud claim to have network POPs as Greg describes in the podcast? All their documentation indicates they are based on an overlay on top of private or public networks, like Viptela. I cannot find info on Velocloud offering a virtual backbone with physical POPOs. Interesting, I hadn’t noticed the shift in their marketing message on this. On this page, http://www.velocloud.com/solutions/hybrid-wan, you can see the Velocloud Cloud Gateways shown in the diagrams. This is repeated in other pages (Architecture). You have me wondering if velocloud is backing away from its POP overlay and moving towards a more traditional model of ‘router replacement’ that customers are familiar with and may be more likely to buy. I’ll keep an eye out and see what I can find. I’m fairly certain those gateways represented edge devices the SP or Enterprise would locate in their own premises, I have not seen any evidence of Velocloud creating their own POPs. For the SP, they have deployed direct links to cloud based services like Amazon or Microsoft and those gateways would be co-located with the SP access to those cloud services so that the SP could claim a better level of service to those cloud services than plain internet transport. Happy to get new (to me) information if it is available. You may be thinking of vendors like Aryaka, who do offer a virtual private backbone. Velocloud does have direct links to major clouds as it has placed cloud gateways in those interconnect locations. Yes, Aryaka also have a virtual backbone, but so do a few other SD-WAN vendors of which Velocloud is one. It does seems that Velocloud have shifted their marketing to walk back from this technology though, which is interesting and I’ll look into it at some point. One vendor staying away from SD-WAN market is HPE. Where they stand in this emerging technology ? To counter balance what Drew said, the data networking market in the Enterprise is shrinking. Customers are not spending on new solutions or upgrading their existing deployments while focussed on public cloud while they work out if that will work for them. HPE managers/execs have been focussed on shrinking the company, selling off assets that are legacy, trimming head count. Its likely not the right time to be buying new business unless there is a clear benefit. HPE doesn’t do WAN today (except for China of course), and entering that market is something that they need to do, certainly, but its a question of when ? might be already too late for them. First off, the offering is simply following a new naming convention, as just over a year ago IBM decided to sunset the Softlayer brand in favour of Bluemix and most recently decided to sunset that in favour of the ‘IBM Cloud’, though not exciting, most people will be able to distinguish between the two. Secondly, this is more of an evolution in their strategy following the BlueBox acquisition, acquired around the same time Cisco acquired Piston Cloud (Where is it Now? ), which too has gone through the same naming conventions, from Bluemix Private and Local, to IBM Cloud Private. Last, but not least the IBM Cloud Private stack is not limited, as it will run on the Mainframe, Power Systems, as well as x86 (Cisco UCS preferred).